Children are an important part of the worshipping community and need to have opportunities that create for them a sense of belonging. Children’s sermons provide this opportunity and should be events of proclamation.Help! I'm Leading a Children's Sermon, Volume 1 contains a collection of children’s sermons designed to involve children creatively in worship and the proclamation of the Word. The collection contains two sermons for each Sunday with a key emphasis on Scripture, including key verses to be read within the sermon. The sermons invite the children to participate in corporate worship in a meaningful, creative way by asking questions and using hands-on activities to explain themes such as hope, forgiveness, repentance and God's sovereignty. Help I'm Leading a Children's Sermon, Volume 1 is an essential book for the collection of any worship leader. Marcia Taylor Thompson is a writer and teaches adjunctly at North American Baptist Seminary in Sioux Falls, South Dakota. She is a mother of three sons, Nathanael, Andrew, and Matthew, and a ministry partner with her husband, Philip Thompson. 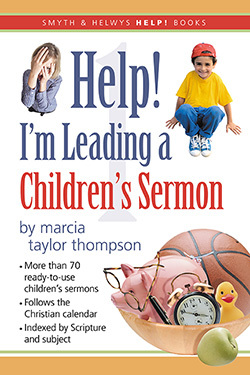 Marcia has served as a Preschool/Children’s Minister and Weekday Director in Virginia, North Carolina and Georgia and has written and edited for Smyth & Helwys FaithSteps and Intersection curriculum for children and youth.